I love the absurd. My lovely friends in Victoria also love the absurd, the silly, and the utterly offbeat -- that's why we are friends. 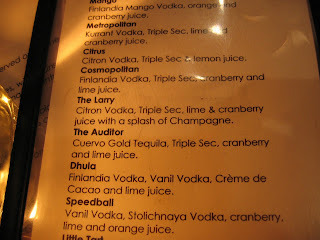 So while I visited Victoria in August, it was no surprise that while at a cocktail bar, we found a drink called The Auditor. Now don't tell me you don't think this is completely silly, because it just is. 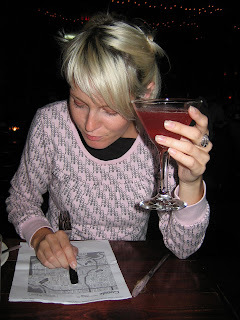 It is almost as enjoyable that there is a drink above it on the menu called The Larry. 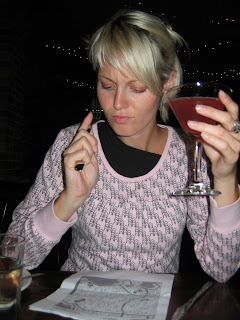 I myself had to go for The Auditor, because what a better prop for posing for pictures could there ever be? Oh! Something is amiss! I've found some botched numbers! 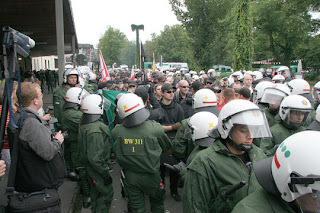 So way back when in July, some Neo-Nazis decided to come to Tübingen for a rally. Why did they choose the peaceful, left-leaning university town? Because it's a peaceful, left-leaning university town. 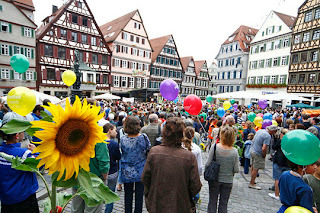 And because, much to most Tübingen residents surprise, the city is home to a prominent right-wing extremist publishing house. Probably the only intelligent thing this publishing house does it to keep a low profile. At any rate, I had written to inform you that this rally was happening and at that time promised photos of it all. Well, here they finally are, although they are taken from the local newspaper, as Sarah and I, in the excitement of the moment, both forgot to take cameras. The rally against the rally, that is the peace rally that was organized in response to the fascist rally, started out in the Main Square of the city, where there were speakers, music, and lots of people handing out sunflowers, probably as a sign of peace and beauty. 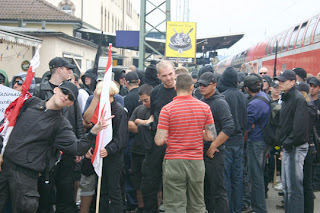 We then walked down to the train station and stood around and waited for the Neo-Nazis. I was in this big crowd of people. There was a lot of music and people trying to have fun, but there is only so much fun to be had when you're packed into the bus station parking lot for six hours. Yup, we waited six hours for some people whose point of view we think is insanely uncool. This is a scene we didn't see: the fascists arriving at the train station. This is actually probably what it looked like for a lot of the day, because the police did a great job of doing what they could: slowing those jerks down. 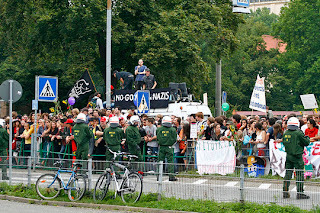 Many people in the crown were calling for the police to stop the rally, but I must remind all citizens of democratic countries that the police don't make decisions, they only carry them out and if they were making decisions on their own about such things, that would be a reason for concern. At any rate, over a thousand police were there that day and they did a fantastic job. 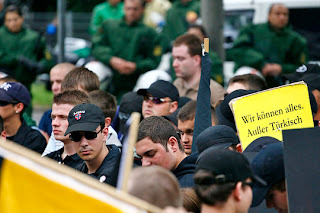 Here are those cute Neo-Nazis again, surrounded by tons and tons of police officers. This was part of the efforts of the police to protect everyone involved in both rallies. Here we see the police keeping the area in front of our group free. Technically, the Neo-Nazis had the right to march in front of where we were standing but the police thought it would be too dangerous for us to all get that close to each other and we whole-heartedly agreed. In fact, we never even saw the Neo-Nazis. For a few minutes at one point we could see their flags, but in the end they only got to march by the train tracks. Here they are again. Pretty normal looking folks for the most part, except that they are holding a sign that says, "We can do everything except speak Turkish." This is a take-off on a popular advertisement for the state of Baden-Württemberg which jests that "We can do everything, except speak high German", which is the form of German that all Germans should be able to speak despite having different dialects. 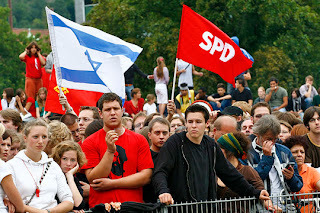 At the end of the day, the Neo-Nazis left Tübingen and had a spontaneous rally in a near by town. The police there let them have their rally, but they weren't allowed to leave the train station parking lot, so I'm sure that was stirring. I think we were all glad about not having let them really enter our city at all, but it remains discouraging to everyone that such movements still exist. Please excuse the current strange-looking Claire in Tuba-Town. I'm (slowly) working on improvements and learning how to make it look snazzier.